Cartoons are as much a part of popular culture as comic books and superheroes. Even today, kids enjoy sitting down and watching animated programs with their favorite characters that make them laugh and smile. Maurice LaMarche and Rob Paulsen are two men who have devoted their lives to voicing cartoon characters and providing endless laughter and enjoyment to people. They are veterans of an industry built upon creativity, entertainment, and imagination. The characters they have voiced on various shows over the years makes them household names with parents and children alike. But perhaps their greatest show and roles are those on Animaniacs. 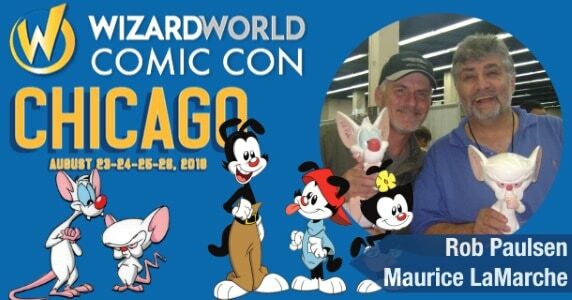 PopCultHQ had a chance to talk to Maurice and Rob about the Animaniacs reboot, the show’s 25th anniversary, and their careers working together. PopCultHQ – This is your first time being in Chicago for a con? Maurice LaMarche – This is my very first time being in Chicago for anything, for life. I went to Oak Park once for a gallery signing in the afternoon at the old Warner Bros. store. But it literally was an afternoon and I never got into the proper Chicago area. So this is going to be my first time in Chicago. PopCultHQ – With the Animaniacs getting a reboot on Hulu in the next year, does that mean fans could potentially see the reunion of Pinky and Brain? Maurice LaMarche – Well, let me put just put it this way. Very excited and it’s very exciting news. I’m very excited to hear about the Animaniacs reboot. Whether or not we’re involved is still up for grabs. It’s neither confirmed nor denied. I just knows there’s gonna be some good stuff coming down the pike. PopCultHQ – 2018 is a year of milestones and Animaniacs turned 25 years old this year. That’s a quarter of a century. If you could go back in time to yourself 25 years ago when you first started, what would you tell yourself then that you know now? Like wisdom and knowledge to impart to yourself back then. Maurice LaMarche – I would say be a little easier to work with. And be really, really grateful that you’re part of this show. At the time, I was younger, I was brasher, I had a bit more of an ego. And I think I could have been just a little more easy-going in those days. And I think I would have pounded a little humility into my brain. Now, now I think I’m at the point where I just go, “You know you’ve been lucky to have had any success at all in this business.” And I really do appreciate all that has happened for me in this crazy showbiz thing, because you know to keep your head above water at all is a miracle. PopCultHQ – A wrap-up question here. Looking back on your past work together with Rob. You guys have been trading banterous blows back and forth for a long time. Are there any standout moments in all your years of knowing each other and working together? Maurice LaMarche – The thing that stands out most is the very first time that we did some publicity in the Warner Bros. office for Tiny Toons. No, no excuse me, it was for Taz-Mania. And we just clicked as a team, just talking as Maurice and Rob. We knew we had fun together in the studio. We knew that our characters from Taz-Mania, who were the Platypus Brothers, had nice timing. But when we were being interviewed together, we had just such a give-and-take as the real Maurice and the real Rob. But I just went, “Wow we, we really, we really have got something here.” And so when we became Pinky and the Brain the next year, we were just super thrilled that it was us working together. So the chemistry that I sorta knew we had from that one interview got to be carried into Pinky and the Brain. I think its one of the reasons it works. Rob Paulsen – In Yakko Warner’s Voice: Hellooooo Josh! Nice to see ya pal, how are ya? PopCultHQ – I’m doing great and it’s pretty hard to come off an opening like that. Now this is your first time doing a convention in Chicago, is it not? Rob Paulsen – It is. I grew up in Michigan just across the lake so I’m kinda in my home territory. But Chicago is, preaching to the choir, it’s one of the finest cities in the universe. And to be here at this really, really wonderful shindig put on by Wizard World is a huge privilege. Great to be here. PopCultHQ – Well, it’s a huge privilege for us to speak with you and to have you here. Now with the Animaniacs getting the Hulu reboot next year with a two season lineup, now I asked this of Maurice earlier. Does that mean we could potentially see the reunion of Pinky and the Brain? Rob Paulsen – Well, we certainly, you will see a reunion of Pinky and the Brain for sure because Mr. Spielberg has definitely decided to do some more Pinky and the Brains. I think your question essentially is, “Will Maurice and I be doing our roles?” And while I can’t say for sure because Warner Bros. will let that news out. Let’s put it this way. If I was in Washington testifying before a Senate Subcommittee I would say, “I can neither confirm nor deny.” So you can read into that what you will. PopCultHQ – I will read into that as a very possible maybe and take it at that. Now 2018 is a milestone year for a lot of television programs. And Animaniacs reached its 25th birthday this year. How does it feel to be a part of a program that has made it a quarter of a century and become so much to so many fans. And if you could back to yourself 25 years ago and impart some wisdom from today what would you tell yourself? So that’s a two-fold question. Rob Paulsen – Well, thank you. Firstly, it is kind of indescribable to be part of something [like this]. I’ve been incredibly fortunate, having done two different Ninja Turtles with a 25-year gap. Talking about a franchise there that was brand new in 1984. So 34 years for the Turtles. Animaniacs and Pinky and the Brain. If Ninja Turtles changed my career, Animaniacs changed my life. Because it was musical and I got to work with Maurice and Tress and Mr. Spielberg and all these wonderful people, Jess Harnell. And we now have, like you said, 25 years since the show aired originally. And you could argue that the fan base is almost three generations. So the wisdom that I would have given to my younger self would have been, “Buddy stick around, because this show is gonna be a big deal. So if you ever get discouraged between now and 2018, get through it because you’re gonna wanna see how exciting this is down the road.” And it’s a huge thrill to be able to share this with the people. PopCultHQ – Final question. You and Maurice have worked together for almost 25 years. Are there any stand-out moments in all the years you have known and worked with him? Rob Paulsen – Well, that is like asking who is your favorite child and you happen to have a hundred children. This is not hyperbole. Every time I work with Maurice it is a remarkable experience. Maurice LaMarche, people don’t know this. Not only is he a genius, literally and figuratively, in terms of being the Brain. But he won back-to-back Primetime Emmys for his work on Futurama. Maurice LaMarche is a movie star. Not only is he that professionally, but he is one of the kindest, gentlest, sweetest, classiest humans you’ll ever meet. And I am a far better human for having Maurice LaMarche in my life. He is a brother and as an actor makes me a whole lot better. So you’re talking to somebody who is the charter member, founder of the Maurice LaMarche fan club. I love that man. PopCultureHQ – And we love him and we love you my friend. Rob, thank you for giving us the gift of your time and thank you for gracing us with your presence at Wizard World Chicago 2018. Rob Paulsen – In Yakko Warner’s Voice: Thank you buddy. Goodnight everybody! 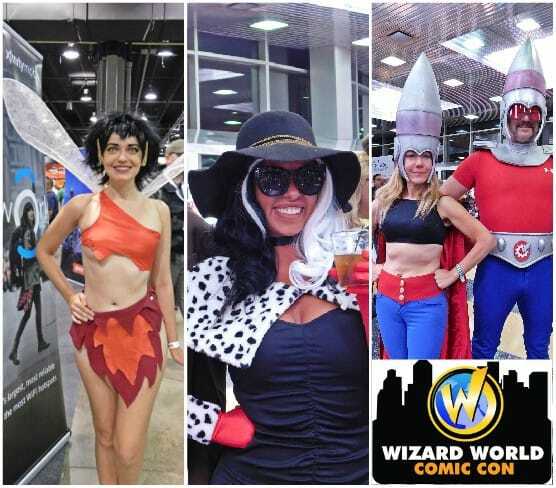 Wizard World, Inc. produces comic, gaming and pop culture conventions across North America that celebrate the best in pop culture: movies, television, gaming, live entertainment, comics, sci-fi, graphic novels, toys, original art, collectibles, contests and more. A first-class lineup of topical programming and entertainment takes place at each event, with celebrity Q&A’s, comics-themed sessions, costume contests, movie screenings, evening parties and more. 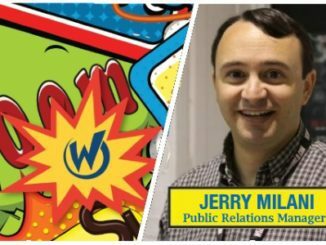 Fans can interact with Wizard World on Facebook, Twitter, Pinterest, Instagram and YouTube. In 1985, Maurice began a second career in the wonderful world of animation voiceovers, finding himself cast as “Chief Quimby” in “Inspector Gadget”, and “Egon Spengler” in “The Real Ghostbusters” in rapid succession. The work has kept coming ever since; he has performed on over one hundred animated series, and has been Emmy-nominated three times (once in Daytime, twice in Primetime) for his voice acting: First, in 1990, for the primetime politically satirical puppet show “D.C. Follies”, starring Fred Willard; then again in 1999 for playing “The Brain” in “Steven Spielberg Presents Pinky & The Brain” (he won ASIFA-Hollywood’s Annie Award later that year for playing the megalomaniacal mouse), and this past year, he was again nominated, and this time, he won the Primetime Emmy Award for Outstanding Voice-Over Performance in Matt Groening’s “Futurama”, where he plays more than seventy regular, frequently-recurring, and one-off characters, including “Morbo The Newscaster”, “Calculon”, “The Donbot”, “Clamps”, “Hedonismbot”, and, Zapp Brannigan’s long-suffering First Officer, “Kif Kroker”. Fans can interact with Maurice on his Twitter. Rob now has the unique opportunity to have gone full circle with the Teenage Mutant Ninja Turtles animated series; having voiced Raphael in the original show, he is now voicing Donatello in Nickelodeon’s much anticipated TMNT. Originally from Detroit, Michigan, Rob “loved cartoons like most kids ” and aspired to be a professional hockey player. “Fortunately, I learned pretty quickly that I had neither the talent, temperament nor dental insurance to pursue a career as a pro hockey player”. Ironically, acting was something to “fall back on” and Rob has voiced beloved characters in several iconic animated series: Yakko Warner in Animaniacs and Carl Wheezer in Jimmy Neutron, Boy Genius, but may be best known to animation fans the world over as the voice of the boisterous and energetic laboratory mouse Pinky in two hit series Steven Spielberg Presents Pinky and The Brain and Pinky, Elmyra, and The Brain for Warner Brothers. Fans can connect with Rob on his Twitter and his Website. Capcom’s Street Fighter V to be Featured at 2016 Wizard World Conventions! February 2, 2016 Manny Popoca Conventions, Game Trailers, Games, News, Pop Cult News, Video Comments Off on Capcom’s Street Fighter V to be Featured at 2016 Wizard World Conventions!